I remember when Thursday and Friday used to be exciting day for all of us as it used to be a weekend holidays for all school going kids in UAE. It used to be Special too as we used to visit my grandmothers best friend. The memory of entering their house and the smell of something delicious frying up used to waft whole house. 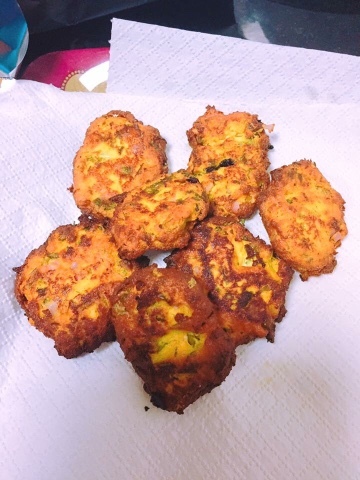 Yes she used to make these Kababs along with Alu ke Parathe and Kachey aam ki Chutney (Raw Mango Chutney). Those times where my mom grandmom and their children would just sit and talk whole afternoon and we kids used to play with toys. These days we just have lost those lovely gatherings those time well spent socializing where people were more interested genuinely in knowing and sharing with each other. The time where technology didn't existed at all. Though the times have passed, she doesn't cook much these days due to old age and deteriorating health but I still love her and her cooking. Here is her recipe that she shared with me ages ago and I have been making it when ever I miss those times. 1 cup oil for frying. Mix all above ingredients together and adjust seasonings as per your taste. Wet your palms and shape the Kababs. Heat oil in a wok on medium heat and as soon as you add Kababs turn heat to medium low and shallow fry until golden on each side. 2. Keep a close eye while frying as these Kababs tend to cook faster if you don't turn them on timeand remove them they will burn.